Providing you the best range of Paper Mache such as Paper Mache Candle Stand Elephant, Paper Mache Elephant Clock, Paper Mache Ashtray and Paper Mache Candle Stand with effective & timely delivery. 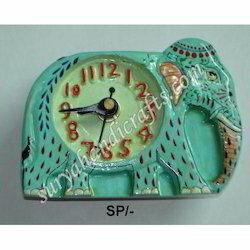 We are specialized in manufacturing and exporting Paper Mache Elephant Clock to our value esteemed clients. With the help of our experienced team, we provide the effective and astonishing patterns. We design this in several sizes and in various shapes to provide an eye appealing look. It is facilitated with the clock so that it helps to know the time frequently. We maintain the national and international standards in terms of quality.